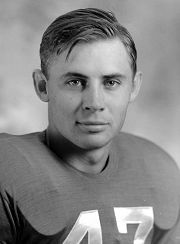 1943: Husker lettermen Henry Reichel and Joe Partington are among the players bolstering Northwestern's roster during wartime. 1988: Neil Smith, the No. 2 pick in the NFL draft, signs with the Kansas City Chiefs and reports to training camp. «1998: George Abel, a guard on Nebraska's first Rose Bowl team and later a prominent businessman and phi­lan­thro­pist, dies at age 78. Also, a knee injury ends the NFL career of former Husker All-American Broderick Thomas. 2003: Steve Pederson lays off eight employees in the Athletic Department, bringing staffing cuts to 10.1% in his first six months as athletic director. 2008: The suspense builds over whether receiver Khiry Cooper of Shreveport, La., will choose Husker football or professional baseball. 2013: Young Jack Hoffman receives the 2013 ESPY for Best Moment.